The 54th Massachusetts Volunteer Infantry Regiment was the first Civil War Union regiment to be composed of enlisted men drawn from the free blacks of the North. It as made possible by the issuance of the Emancipation Proclamation on January 1st, 1863, and was initially the subject of bitter controversy. 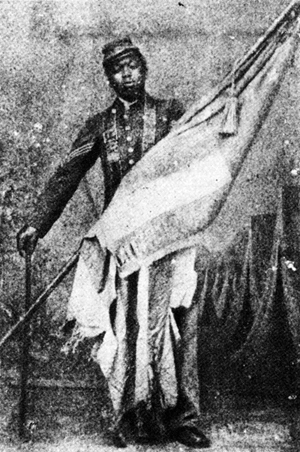 However, the extraordinary performance and bravery of the regiment markedly altered people’s attitudes and perceptions, leading to formations of further regiments, with a wartime total of 186,097 (7,122 officers, 178,975 enlisted) African American enrollments contributing a key component of the Union victory. This blog presents the year 1863 as seen through the letters and books written by the soldiers and officiers of the Massachusetts 54th, together with associated and related writings. Each day’s blog posting presents the letters, excerpts, proclamations, etc. which were written or issued on that day, along with links to articles from the New York Times for that day. The first blog posting be January 1, 1863 — appearing on Janauary 1, 2010 –, and thereafter, the posts for each day of 1863 (for which there are letters or material) will occur on the corresponding day of 2010. Maps and related books will appear in the sidebar, together with a listing of the names of individuals who enrolled in the regiment on that day. These entries link to the individual’s full entry in the regiment’s roster, which is provided. The 54th Massachusetts Volunteer Infantry Regiment was the first Civil War Union regiment to be composed of enlisted men drawn from the free blacks of the North. It was made possible by the issuance of the Emancipation Proclamation on January 1st, 1863, and was initially the subject of bitter controversy. However, the extraordinary performance and bravery of the regiment markedly altered people’s attitudes and perceptions, leading to formations of further regiments, with a wartime total of 186,097 African American enrollments (7,122 officers, 178,975 enlisted : 9.5% of the union armies), contributing a key component of the Union victory. This blog presents the year 1863 as seen through the letters and books written by the soldiers and officers of the Massachusetts 54th, together with associated and related writings. Each day’s blog posting presents the letters, excerpts, proclamations, etc. which were written or issued on that day, along with links to articles from the New York Times for that day. The first blog posting — for January 1, 1863 — will appear on Janauary 1, 2010, and thereafter, the posts for each day of 1863 for which there are letters or material will occur on the corresponding day of 2010. Links for maps and related books will appear in the sidebar, together with a listing of the names of individuals who enrolled in the regiment on that day. These entries link to the individual’s full entry in the regiment’s roster, which is provided. This entry was posted on Wednesday, September 23rd, 2009 and is filed under Uncategorized. You can follow any responses to this entry through RSS 2.0. Both comments and pings are currently closed.